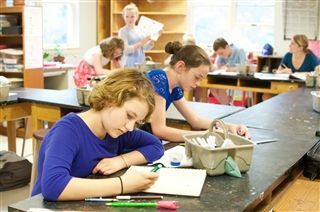 We often define the Middle School years as a time for exploration of new ways to express oneself. Within our Visual and Performing Arts program, students are presented with a variety of classes and outside opportunities to try something new, to delve into a newly found visual art or performing arts class, and take a step on the stage to prove one’s confidence and skills. We take great pride in our program which is based on exhibition and performance. Middle School students may elect to participate in our dance program which provides avenues for technical and creative development. 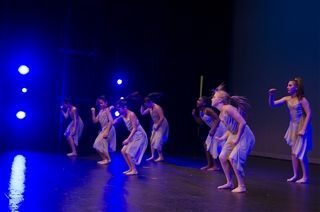 Dance is approached as a collaborative venture for students with an emphasis on interactive skills, discovery, and courage. We are pleased to offer ballet, jazz, tap, hip hop, and modern technique classes. As students become more advanced dancers, they take on choreographic aspects of performing. The Middle School musical production is one of the highlights of the year. 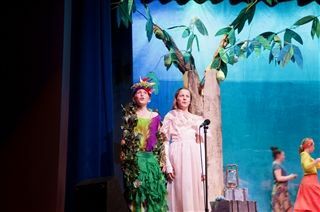 Recent performances include: Once on this Island, Charlie Brown, The Wizard of Oz, Pirates of Penzance, and High School Musical Jr. All students are encouraged to take part in this all-division performance. We understand that not all students want to be on stage; and therefore, their energies are directed toward working on wardrobe, tech, publicity, set design, and scenery. Rehearsals for the musical are held outside the regular school day. Performing Arts in the Middle School offers five ensembles for students in grades five and six: African Music, Chorus, Concert Band, Guitar Ensemble, and String Ensemble. Students in grades seven and eight may choose from Advanced Band, African Music, Chorus, Guitar Ensemble, String Ensemble and Theater Arts. All ensembles are grouped together as 5-6 ensembles and grades 7-8 ensembles. 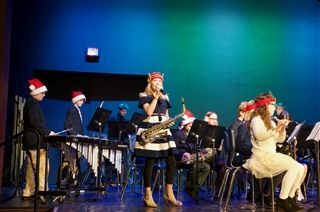 Concerts are held for all ensembles in December and May each year. Each student arrives as an artist, bringing a different level of experience and interests. Students strengthen their understanding of art and principles of design through a variety of media and study of the masters. In many cases, art lessons are incorporated into the curriculum in classes like humanities where students learn about the African culture and its villages. Students demonstrate their artistic interpretations of the lesson by creating African masks in their art class.